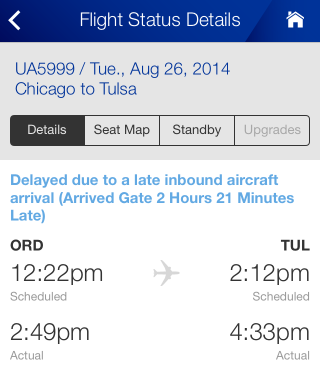 It’s not uncommon to have delays going through Chicago, but this Monday’s trip to Tulsa was a bit involved. My original plan was to depart Dayton at 12:19 PM Eastern (11:19 AM Central), land at Chicago O’Hare at 12:27 PM Central, get some lunch, then take a 3:50 – 5:40 PM Chicago to Tulsa flight, leaving me with plenty of time before the Tuesday morning start of a three-day meeting. We boarded the ERJ-145 on time, and as we were being pushed back, the captain came on the intercom and informed us that Chicago air traffic control was holding us at DAY due to a VIP movement ramp closure in Chicago – the Vice President was in town for a fundraiser – and we would have to wait at least a half hour to depart. We parked near the runway and waited. 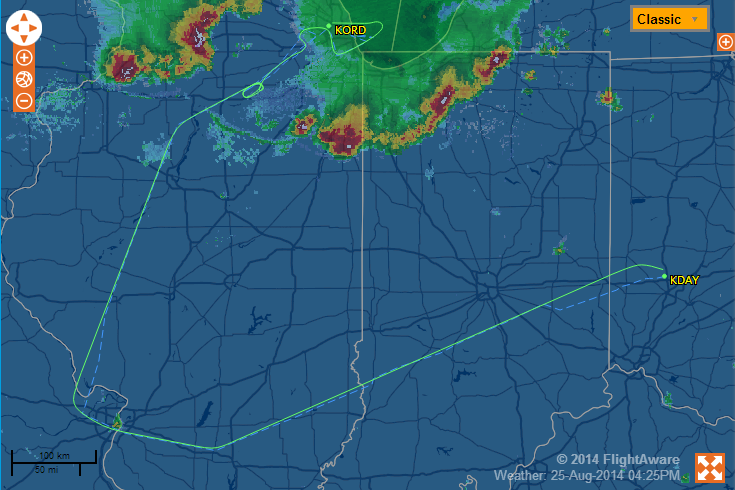 Just around the time the VIP restrictions ended, a thunderstorm passed through the Chicago area, causing Chicago ATC to tell us to wait at Dayton even longer. After several more push backs of the departure time, our pilots took us back to the gate to let us wait in the concourse. I exited the plane and elected to have lunch at the Dayton airport. After some brief scares where other Chicago-bound flights were cancelled, air traffic control eventually gave us a wheels up time of 3:00 PM Eastern, and we reboarded the aircraft. After the door closed and our (second) safety briefing, the pilot once again came on and let us know there was good news and bad news – the good news was that we were still cleared to depart for Chicago, but the bad news was that due to the weather we needed to take a longer route to get there. We’d fly west over to the St. Louis area, then northeast to Chicago; this would add an extra 45 minutes onto our normally 1-hour flight, and required us to wait to get some more fuel before departure. So, after a much longer time in the air than DAY-ORD usually takes, including a bit of circling in a holding pattern, our flight crew announced that we were ready to land, but that there’d be some turbulence. We came in from the west at what felt like much faster than normal, bumping the whole way down, and as we were a few hundred feet off the ground, the plane rolled sharply right, then left, then leveled out and we heard the engines spin up, starting to climb as we aborted the landing. After we leveled off, we flew out over the lake and then came back in for our second attempt at a landing, this time from the east. After all of that, we arrived safely on the ground at about 4:30 PM Central – over four hours after we were scheduled to arrive. Of course, the airport was absolutely full of aircraft, since there’d been rather a long time when nobody had been able to depart. The taxiways were effectively traffic jammed, and the gates were full, so we pulled over somewhere to wait for our gate. While we were taxiing, I turned on my phone to check the status of my next flight, since we were already past the departure time of my connecting flight, and found out that it had been cancelled anyway. Fortunately, United had booked me on another flight to Tulsa later that evening, but unfortunately, I got an alert while we were waiting for a gate that that one had been cancelled too. We finally arrived at the gate at about 5:15 PM, and I proceeded to the concourse B customer service center. The customer service line was hundreds of people long and snaked down the concourse. Fortunately, I have enough frequent flyer status with United Airlines to be able to use the premier customer service line, and only had to wait half an hour to talk to an agent. She let me know that there were no more fligths to Tulsa remaining that evening, so I could either take a 12:22 PM flight the next afternoon, or I could try to fly into an alternate airport. 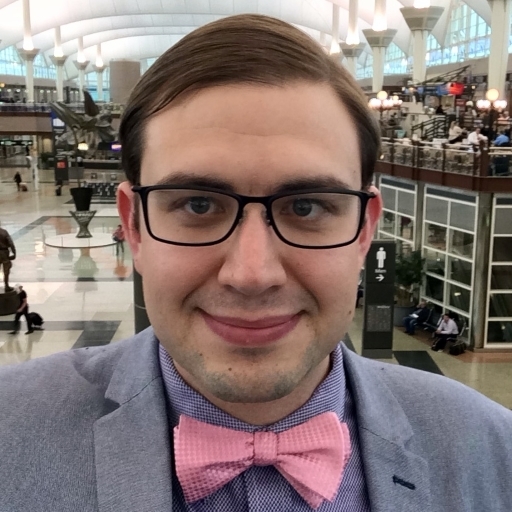 I had her check to see if I could get a flight to Oklahoma City instead, as that two-hour drive would be feasible as long as I didn’t get in too late, and there was one available which had been delayed but was presently scheduled to depart Chicago at 7:00 PM. Great! I headed to the F concourse to catch my flight. By the time I arrived, the departure had been pushed back to 8:00 PM, so I elected to walk to concourse K to get dinner at Tortas Frontera, which had actually been my lunch plan before my first flight was delayed. I returned to my gate, which had now been moved to E4, and shortly after, the flight was delayed again to a 9:30 PM departure. This would have gotten me into Oklahoma City after 11:15 PM, which would make driving to Tulsa impractical and unsafe – at the very least, I’d have to get a hotel room in Oklahoma City and make the drive in the morning, and even doing that there was no reasonable way I’d be on time for my Tuesday morning meeting. So I spoke to the gate agent and had them switch my flight back to the Tuesday lunchtime flight to Tulsa, hoping I’d be able to at least catch part of the afternoon meetings I was scheduled for. So now I would be spending the night in Chicago, and none of the hotels I could find within shuttle distance of the airport had any space available. 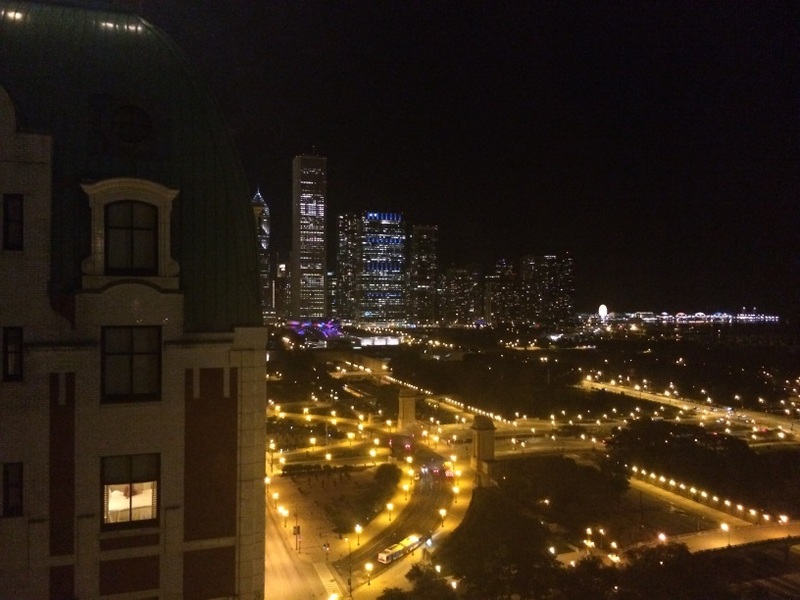 Fortunately, Chicago has a train line that runs directly from O’Hare to downtown, and I was able to find a hotel at the appropriate per diem rate near the Loop. I took the Blue line, checked in, and then walked around the city for a while. It turned out I’d made the right call switching back off of the Oklahoma City flight. I’d left that flight in TripIt, so I kept getting alerts all evening about further delays. It looks like it didn’t end up landing at OKC until after midnight. The next morning I walked back to the train station and rode back out to the airport, arriving a bit after 10:00 AM. The landside monitors were already showing a number of delays, which was not a good sign, but my flight was still showing as on time. Security was quick with my TSA PreCheck, so I had a little time to walk around the airport before grabbing some lunch and heading to my gate… only to find out that my flight was now delayed due to a late incoming aircraft. We did finally get our aircraft and leave for Tulsa, arriving nearly two and a half hours late, and ultimately getting me to Tulsa nearly 23 hours later than I’d planned to be. I’ve only had one trip using the Milwaukee airport, when I went to visit some friends in Appleton, WI at the tail end of my Chicago Christmas and New York New Year’s. 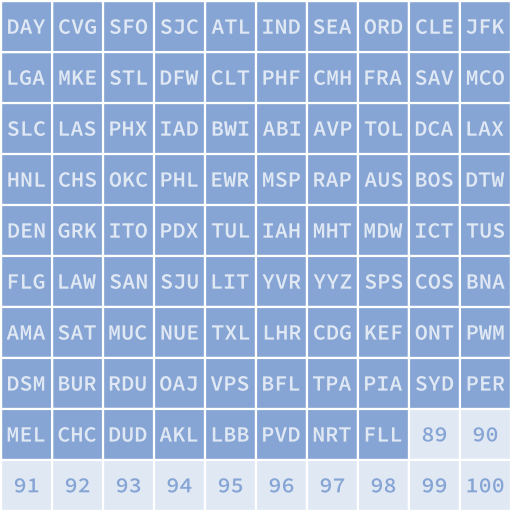 I don’t honestly remember much about the airport – it is, of all the airports on my Flight Log, the one I’ve visited the least recently.